Workers produce medical marijuana at Canopy Growth Corporation's Tweed facility in Smiths Falls, Ont., on February 12, 2018. Constellation Brands Inc., the global alcohol company that makes Corona beer and Robert Mondavi wine, is taking aim at the booming cannabis market with a $5-billion bet on Canopy Growth Corp. − hedging against potential declines in beer and liquor sales as consumer tastes shift. The investment in the Canadian marijuana grower, announced on Wednesday, is by far the largest deal to date in the cannabis industry. It cements the link between the alcohol-beverage giant, with all of its marketing and deal-making expertise, and the emerging sector, where recreational use is winning legitimacy in Canada and elsewhere. 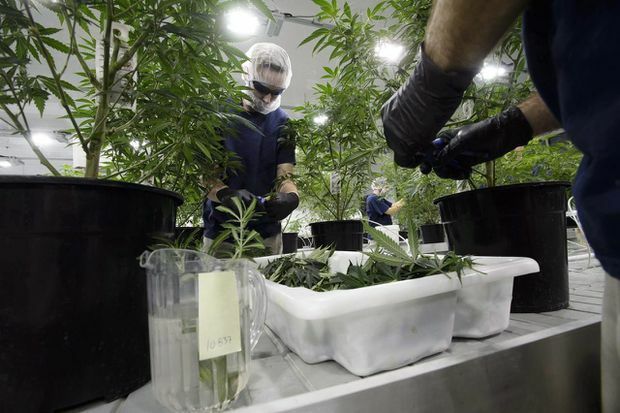 With the proliferation of new marijuana products, ranging from cannabis-infused drinks to creams and sleep aids, incumbent players from the liquor and pharmaceutical industries are having to rethink their view of the long-taboo plant. News of the deal sent shares of Canopy surging 31 per cent on Wednesday, giving the company a market value of some $9.2-billion. It’s a rich valuation, given Canopy on Tuesday reported first-quarter revenue of $25.9-million and a net loss of $91-million. Constellation, based in Victor, N.Y., took the cannabis industry by surprise last October when it bought into Canopy for $245-million. The latest deal will increase its position to 38 per cent from roughly 18 per cent, as Constellation purchased 104.5 million Canopy shares at $48.60, a 51-per-cent premium to Tuesday’s closing price on the Toronto Stock Exchange. Canopy is also granting Constellation warrants, which, if fully exercised, will lift its interest above 50 per cent and inject another $4.5-billion into the marijuana producer, based in Smiths Falls, Ont. Mr. Linton stressed that Canopy, the world’s most valuable publicly traded cannabis company, is not looking to buy more growing facilities in Canada, where recreational marijuana becomes legal on Oct. 17. It may, however, use the cash to build bottling facilities for cannabis beverages and expand its retail footprint, particularly in Ontario where the new Conservative government recently opted to allow private cannabis retail stores. Last month, Canopy acquired cannabis retail brand Hiku Brands Ltd., which it plans to roll out alongside its own retailer, Tweed Main Street, throughout Ontario and other provinces that will permit private retail sales, such as Alberta and British Columbia. The main focus of the deal, however, is international, Mr. Linton said. Over the past several years, Canopy has been expanding its presence in countries such as Germany, Australia and Colombia where medical cannabis has been approved at a national level. These markets are all early stage, with only several thousand patients using cannabis products for medical purposes. But Canopy is hoping to repeat the success it had in Canada’s medical market, establishing an early toehold by acquiring companies with experience operating in those countries’ regulated medical industries. An even bigger opportunity could be in the United States, which is expected to dwarf the size of Canada’s medical and recreational markets. A number of states have legalized cannabis use, although the drug remains illegal at the federal level, creating uncertainty for companies looking to invest. The major catalyst for entrance into the United States could be the States Act, which is currently before the U.S. Senate, Mr. Linton said. The bill would federally recognize the right of states to make their own decisions on whether to allow legal recreational cannabis. A deal this size is likely a wake-up call for other large alcohol players, Mr. Landry said. Smaller deals are already starting to take shape. Two weeks ago, Molson Coors Brewing Co. announced a joint venture with Quebec cannabis grower The Hydropothecary Corp. to develop cannabis-infused beverages. Heineken NV’s U.S. craft-brew subsidiary Lagunitas is developing its own THC-infused drinks. The pace of established companies entering the cannabis market will likely increase in the coming months and years, said Matt Bottomley, an equity analyst with Canaccord Genuity Corp.
Pharmaceutical companies have begun taking interest in the medical side of the industry, most notably Sandoz Canada Inc., a subsidiary of pharma giant Novartis International AG, which struck a branding deal with Tilray Inc. in March, and generics drug producer Apotex Inc., which has a partnership with CannTrust Holdings Inc.
Other Canadian cannabis companies could stand to benefit from these partnerships and most of the large licensed producers traded up on the Constellation news, with both Aurora Cannabis Inc. and Aphria Inc. closing around 20 per cent higher. The deal, which was overseen by Goldman Sachs and bankrolled by Bank of America Merrill Lynch, is expected to close in October after shareholder and regulatory approvals. As part of the agreement, Constellation will name four directors to Canopy’s board, the companies said.